The Evolis Quantum has been discontinued. No direct replacement is available. 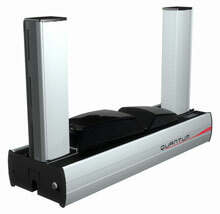 The Evolis Quantum is a modular system and can be customized on-site by its user according to the need of the moment. Its features can be scaled to support specific and evolving requirements. The Quantum has different modules to speed up the personalization process and manage the printing and encoding processes at the same time. Quantum provides stunning printing performances: more than 1,000 cards per hour in monochrome and more than 150 cards per hour in color. With Quantum, all of the components have been engineered to support high-volume batches, while a new cleaning process and an airtight cover protect the system against dust. Convenience and ease of use Quantum is fully user-oriented. All core mechanical and electronic concepts have been designed to ease and speed up daily use and maintenance tasks. Quantum outperforms desktop printers and stands as an affordable alternative to industrial machines while bringing a wealth of features at a cost-efficient price. Thermal transfer, basic, 300 dpi, Color double-sided printing at 115 cards/hour, 2.125" card width, USB + parallel interface, 16MB RAM. Includes: Printer, Power cord, USB cable, eMedia Card Design software. Thermal transfer, 2 Mag, Smart Contact, Contactless, 300 dpi, Color double-sided printing at 115 cards/hour, 2.125" card width, USB + Ethernet interface, 16MB RAM. Includes: Printer, Power cord, USB cable, eMedia Card Design software. Card printer bundle. Includes: Quantum Printer (Part# QTM206GRH-BS), Production Pack (Part# QTM2-KT001), and Backup Pack (Part# QTM2-KT002). Thermal transfer, Smart Contact Station, Gemcore 410 EMV, 300 dpi, Color double-sided printing at 115 cards/hour, 2.125" card width, USB + parallel interface, 16MB RAM. Includes: Printer, Power cord, USB cable, eMedia Card Design software. Thermal transfer, Contactless, 300 dpi, Color double-sided printing at 115 cards/hour, 2.125" card width, USB + parallel interface, 16MB RAM. Includes: Printer, Power cord, USB cable, eMedia Card Design software. Thermal transfer, Smart Contact Station, MagISO, 300 dpi, Color double-sided printing at 115 cards/hour, 2.125" card width, USB + parallel interface, 16MB RAM. Includes: Printer, Power cord, USB cable, eMedia Card Design software. Thermal transfer, Smart Card Contact, 300 dpi, Color double-sided printing at 115 cards/hour, 2.125" card width, USB + parallel interface, 16MB RAM. Includes: Printer, Power cord, USB cable, eMedia Card Design software. Thermal transfer, dual magnetic stripe encoder, 300 dpi, Color double-sided printing at 115 cards/hour, 2.125" card width, USB + parallel interface, 16MB RAM. Includes: Printer, Power cord, USB cable, eMedia Card Design software.